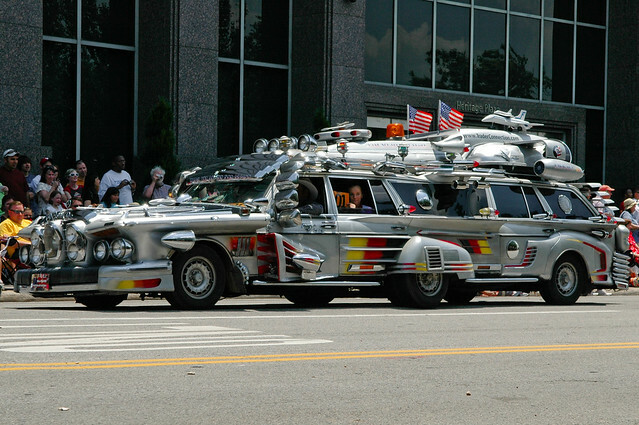 The Houston Art Car parade is the largest of its kind anywhere, despite the counter-culture popularity of turning your vehicle into a work of art. In Houston, the parade’s history began in 1984 when a couple donated a station wagon to The Orange Show Center for Visionary Art. An artist named Jackie Harris, working with a budget of $800, used paint and plastic fruit to transform the station wagon into a moving piece of art and history. 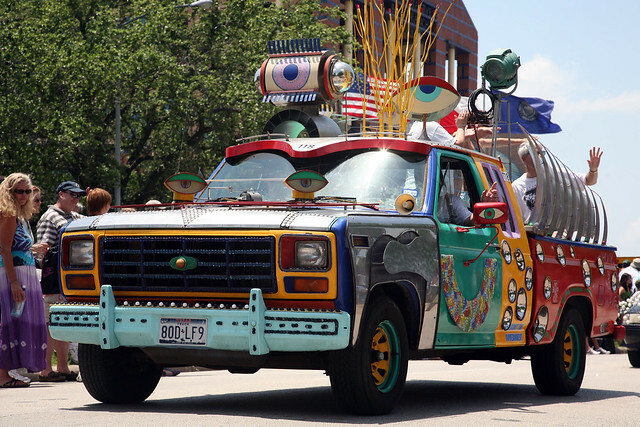 The city began to see a number of “art cars” on the streets around town, and by 1988 the foundation was ready for its first official Art Car parade. For fans of the art car who can’t make it to Houston for the actual parade, there’s also the Art Car Museum at 140 Heights Blvd. in the heart of Houston. But to stimulate your appetite for the Fruitmobile and other art cars, we’ve gathered some prime examples for your enjoyment. 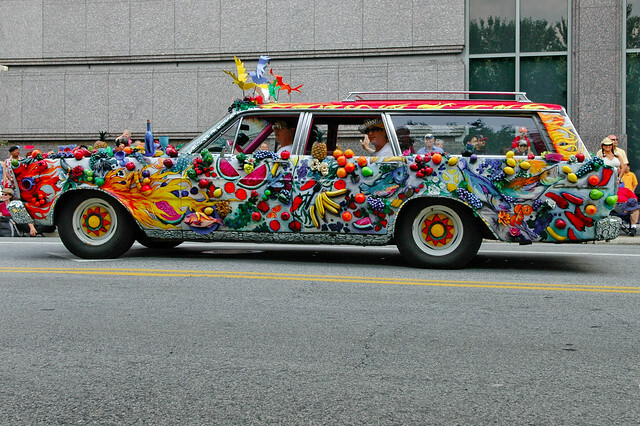 Fruitmobile – The original Houston art car features every imaginable kind of fruit glued onto the body panels of the station wagon. 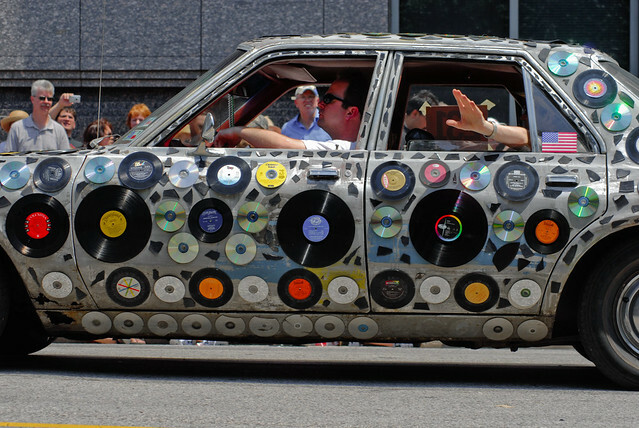 Music Car – if Carmen Miranda isn’t your thing, perhaps you’ll prefer this art car covered in old vinyl records and CDs. 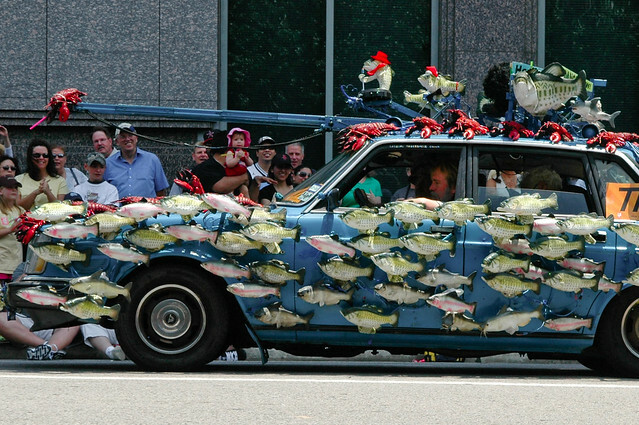 Fish Car – Outdoorsmen and sport fishers will enjoy this art car covered in fish – and a few lobsters for effect. 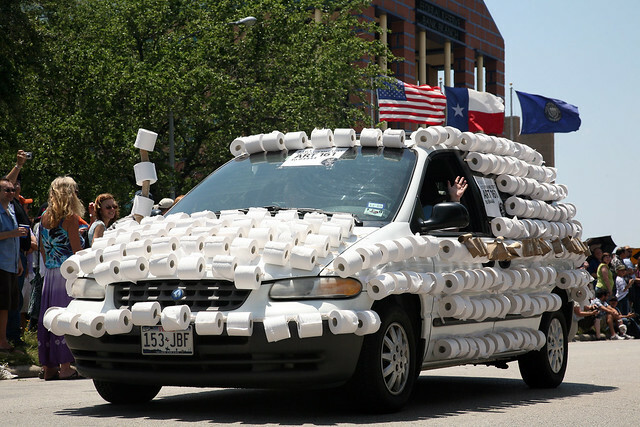 Toilet Paper Car – Don’t worry about finding a port-a-potty during the parade, just look for the toilet paper car. Although the original concept started by gluing items to a car, others have taken it in different directions. These art cars are distinguished by their unique paint schemes. Mondrian Car – Dutch painter Piet Mondrian is known for his geometric paintings based on black and white rectangles highlighted by primary colors. The Mondrian car pays homage to the great artist, complete with a “MNDRIAN” vanity license place. 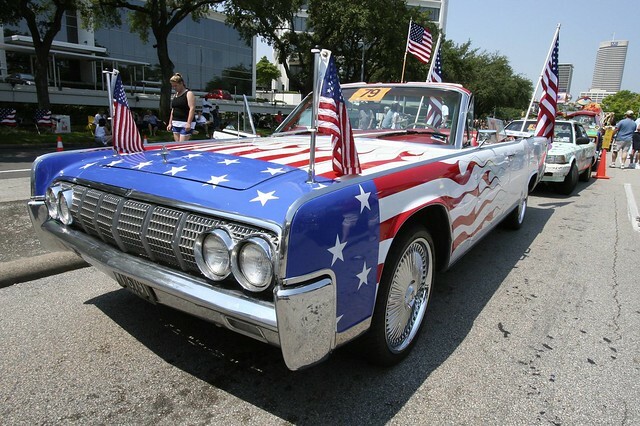 American Flag Car – This 1964 Lincoln Continental shows its national pride with a custom stars and stripes paint job. Modern Art Car – The Montrose and Memorial areas of Houston are known for their modern art, and this truck’s paint scheme and prosthetics reflect that tradition. People never miss a chance to share and spread their political opinions and build awareness for causes that interest them. 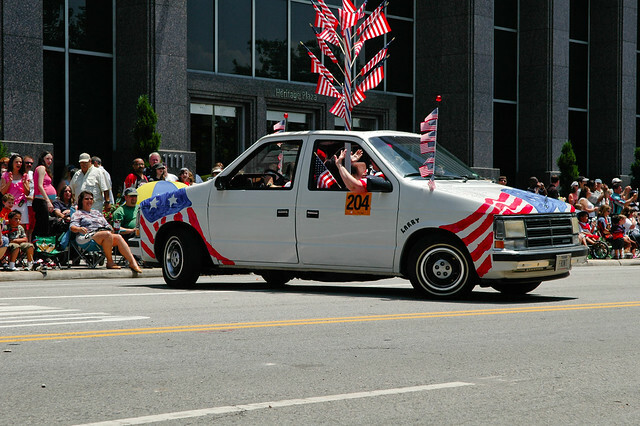 Some art cars are designed to promote political beliefs, such as the following. 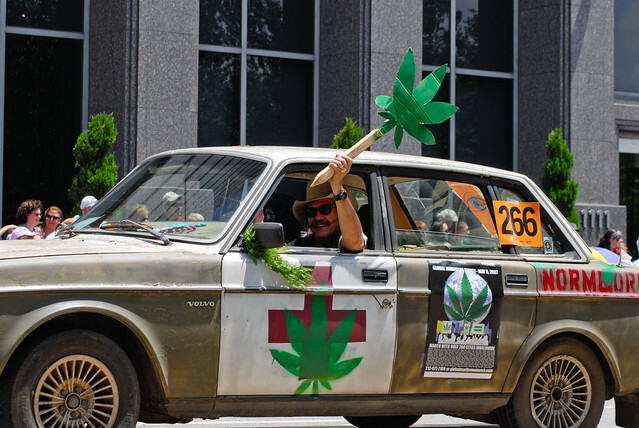 Legalize Marijauna Art Car – this Volvo, and its driver, are ready for Texas to legalize pot smoking. 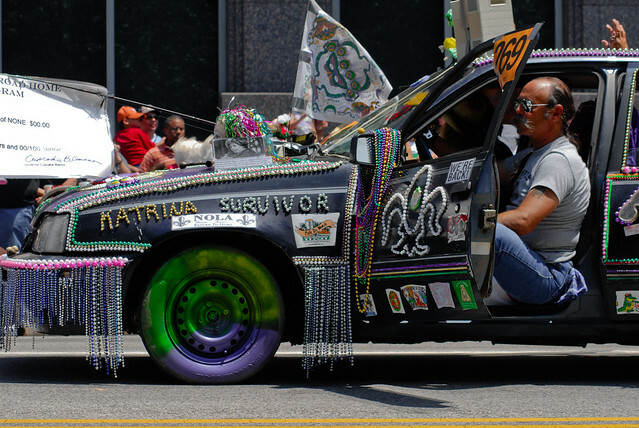 Katrina Survivor Art Car – in the wake of Hurricane Katrina, many displaced families from New Orleans ended up in Houston. At least one of them made his way into the Art Car Parade, along with most of his Mardi Gras bead collection. Some cars look like cars with art on them, and some are barely even recognizable as vehicles. 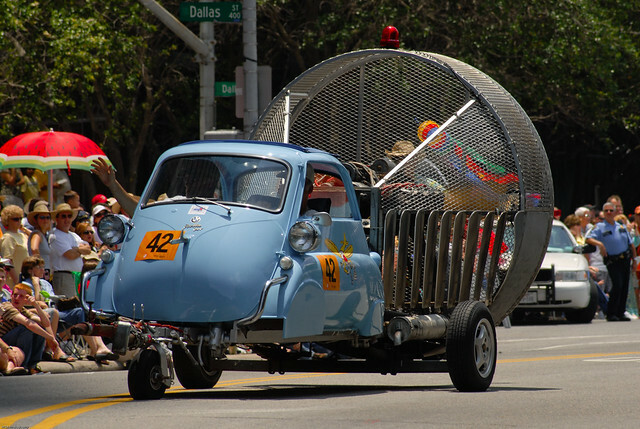 Here are some art cars that have morphed into something else. 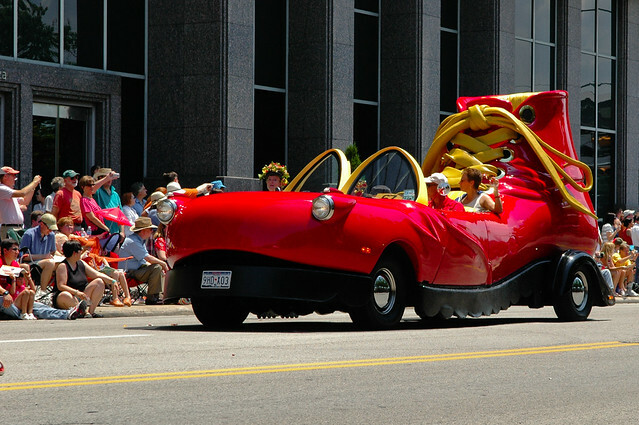 Ronald McDonald’s Shoe Car – the fast food chain McDonald’s permeates much of America’s culture, as well as our eating habits. So why not turn a car into the mascot’s famous clown shoe? Complete with Golden Arches for the windshield. Head Case – This car features a beautiful set of pearly whites, as viewers stare down the throat of a head tilted backwards. At least you can’t see into his nostrils. 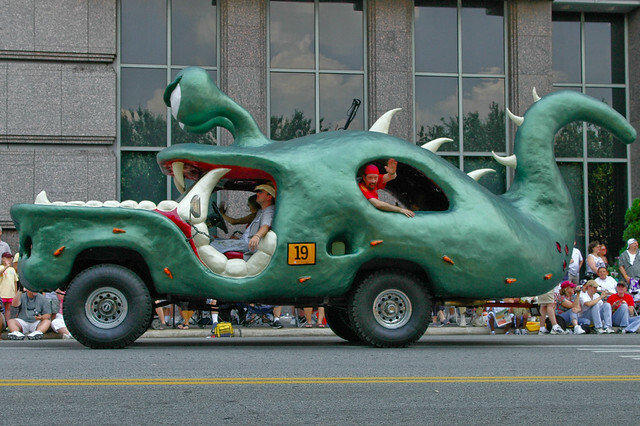 Alien Car – Protruding googly eyes, spike teeth, and a green tail make this car into a superb monster. Or alien. Or both. 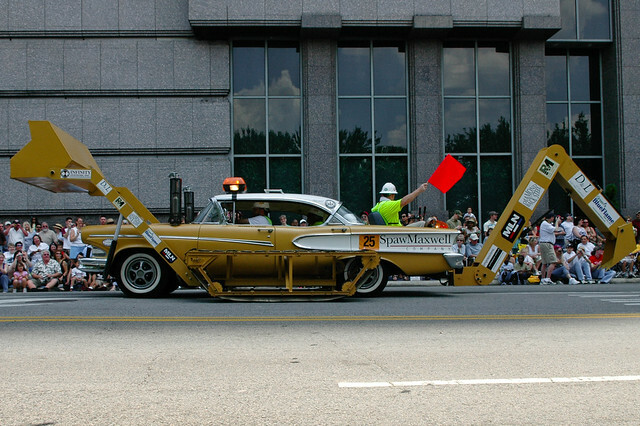 Bulldozer Car – This Edsel Pacer, with its Caterpillar-yellow paint, has been turned into a one-of-a-kind bulldozer. Push Me Pull You – This car can’t decide if it’s going backwards or forwards. Rocket Limo – Houston, we have a limo…Houston IS home to NASA’s Johnson Space Center, after all. Mirror Image Bug – Britain may have invented the double decker bus, but leave it to to art community to flip it on its head. Air Boat Car – In Florida, air boats use fans like these to navigate shallow waters, but this car uses it to power its way down the street. 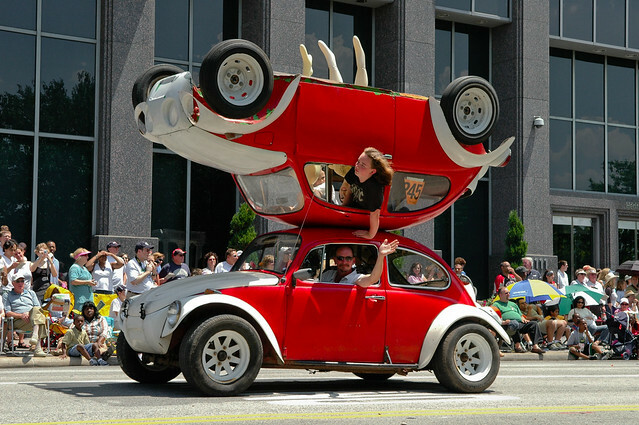 We hope we’ve whetted your appetite for Houston’s art car scene. If so, plan accordingly – the 2013 parade is scheduled for Saturday, May 11, 2013. Author Mandy Villanova is writes on behalf of Volunteer Vette, a Tennessee-based business and website that carries a large selection of corvette parts for sale.